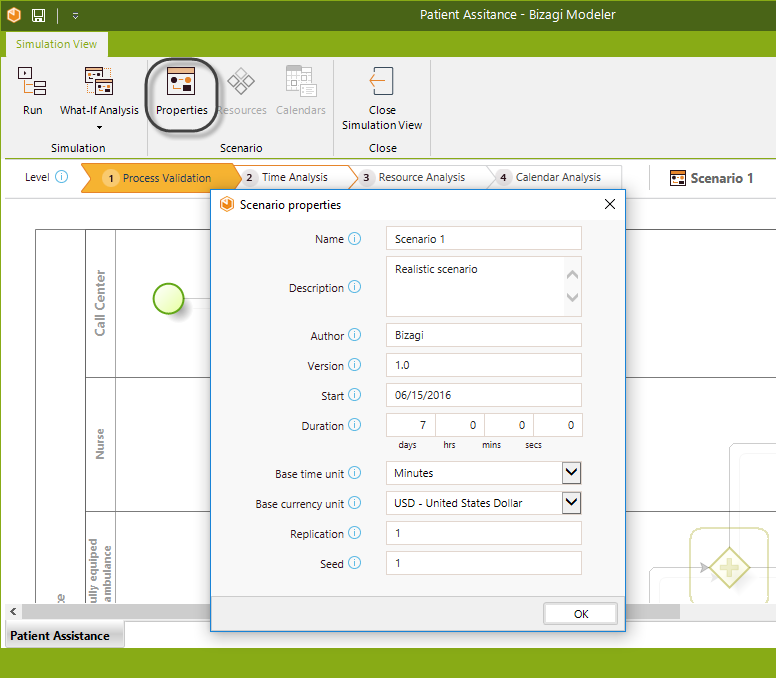 Bizagi Simulation allows you to create multiple scenarios for your process model, to analyze different combinations of data input and observe many possible outcomes. Scenarios are completely independent from one another, from the definition of the scenario itself to the data included in each shape of the model. 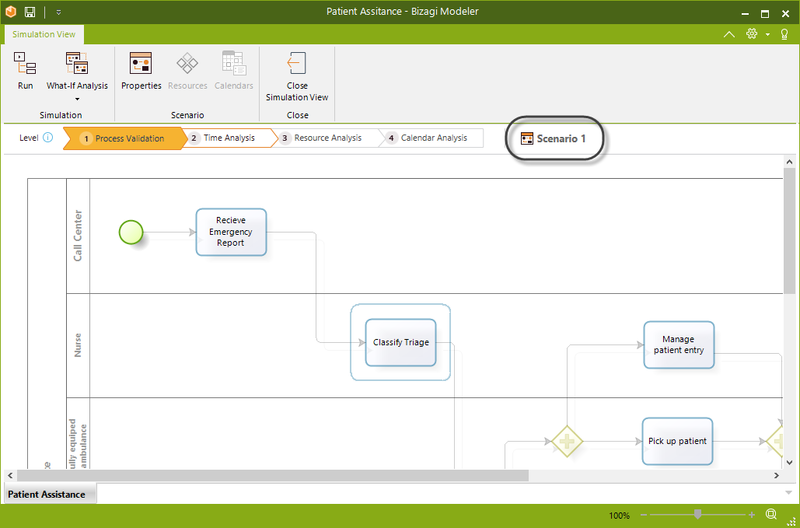 Click the Properties button in the ribbon to manage the scenario. •Name: The name of the scenario. It should be clear and descriptive to easily identify the simulation conditions. •Description: A detailed description of the new assumptions and changes made to the process. •Author: The person or group that created the scenario. •Version: The version number of the scenario. •Start: Date on which the simulation starts. •Duration: Period of time during which the process will be simulated. •Base Time units: The units in which time metrics and results will be displayed. •Base currency unit: The units in which cost metrics and results will be displayed. •Replication: Number of simulations for the given scenario. •Seed: Value of the seed used to generate random numbers. We recommend using 30 replications to make sure the simulation reaches a stable state. For the replications to take place, keep in mind that you should run the What-If analysis which provides direct results (instead of using the graphical simulation with Real-time display at the Run option). Notice that you may select only 1 scenario, to run the 30 replications. The simulation will execute according to the duration defined disregarding the max arrival count. If the max arrival count is reached and the duration is not, the resources will remain idle and the results may not reflect the reality. If no duration is defined, the default duration is 30 days. To create a new what-if scenario, select the What if option (found in the Simulation group on the ribbon) and select Manage scenarios. 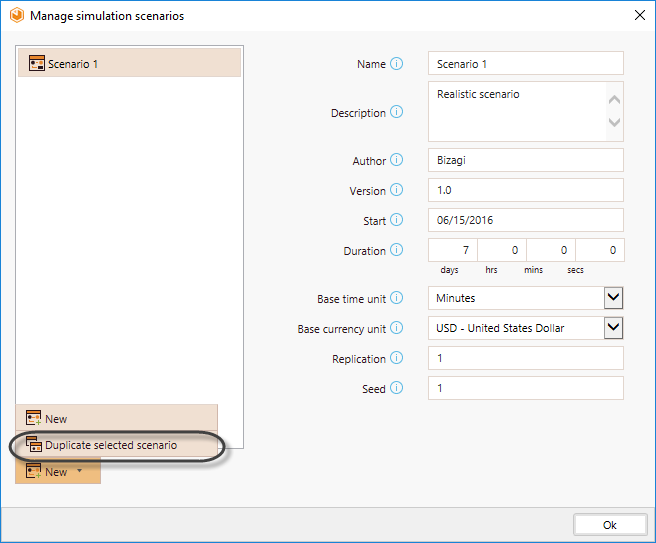 •New: Creates a scenario with blank simulation parameters. •Duplicate selected scenario: Creates a copy of the current scenario with the same parameters configurations (number of resources, processing time, calendars etc). Edit the new scenario to add specific information to your activities.